Spring Street Smokehouse is an American Bar-B-Que joint offering all the classic barbecue meats, hickory-smoked from four to 12 hours. The meat is wonderfully dense and smoky and includes all the favorites you'd expect: Beef and Pork ribs, Texas hot links, Brisket and Pulled Pork . The down-home sides of mac & cheese, beans and cornbread round out a truly authentic BBQ experience. Spring Street also features some surprises, the most intriguing of which is the chicken stuffed with peppers, onions, and cheese, then wrapped with bacon and pit-smoked. The Carolina styled sauce is fragrant with apple cider vinegar and clove, served warm over the meats. Fresh made desserts including Bourbon bread pudding and Peach cobbler create a truly comfort meal experience. All smoked meats are served with pickles, onions and a choice of any two sides. Served with pickles, onions and a choice of any three 6oz. sides. Kitchen Sinks are served with pickles, onions and a choice of (4) / 12-oz sides. BIG Kitchen Sinks are served with pickles, onions and a choice of (4) / 24-oz sides. All sandwiches smoked meat sandwiches come topped with slaw and BBQ sauce. Smoked and pulled pork, ranch dressing, muenster cheese, creamy slaw & fried onion straws. Cornmeal crusted deep fried catfish, creamy slaw, caramelized onion, tomato & sweet relish. Smoked ground beef, vinegar sloppy joe sauce, horseradish mayo, sweet relish & onion straws. Smoked chopped chicken, ranch dressing, muenster cheese, creamy slaw & fried onion straws. Pulled pork & a Hot Link, horseradish mayo, creamy slaw, fried onion straws & pickled jalapeno. We can help you design your menu! 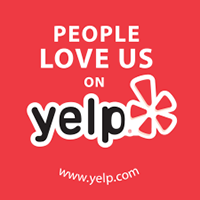 Call 213.626.0535. Served with sliced pickles, onions and white bread. I love their apple cider vinegar based sauce. 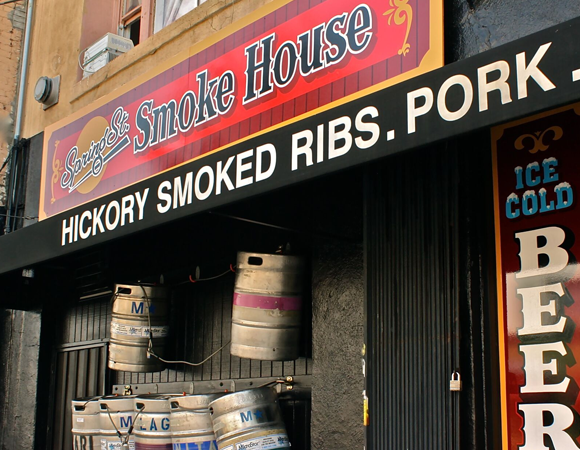 Savoury bbq + nice cold beers + kickback place = enjoyable an unforgettable evening in DTLA. This place is awesome! Quality meat, tasty sauce, and great beer. On the 10 East, merge onto the 110 North. Follow the signs to merge onto the 10/5 freeway transition ramp. Exit at Broadway and continue straight through the light for 2 blocks to Main St. (Do not turn onto Broadway). Make a left onto Main St. and continue to Cesar Chavez and make a left. 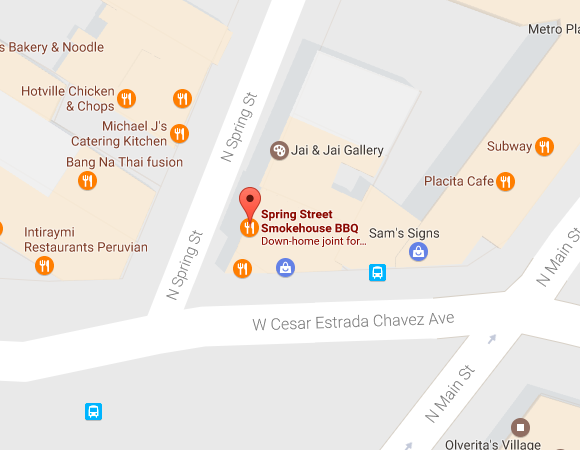 Make an immediate right onto N. Spring and the restaurant is on your right (If you went to the Spring St./New High stoplight you went too far). There is some metered street parking. There are also 3 pay to park lots within 50ft. of the restaurant. © 2017 Spring Street Smokehouse. All rights reserved.